Customer Support Provided through external support system athttp://pressapps.co/support/ with queries answered within 48 hours Mon – Fri. Support covers setup, product features, and bug fixes. 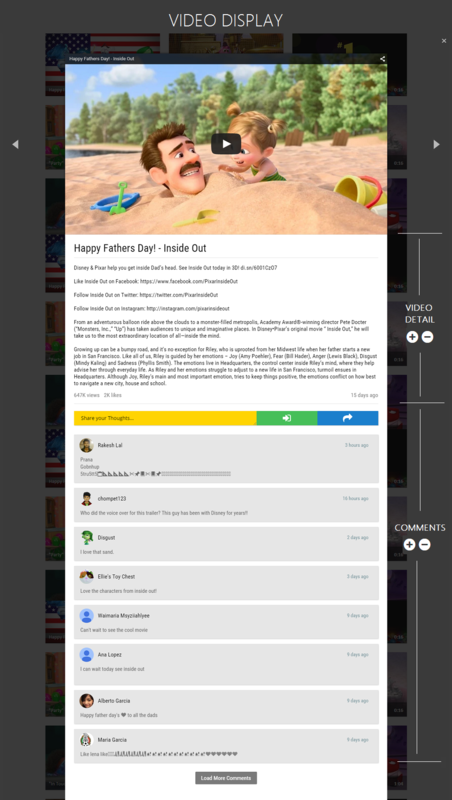 This entry was posted in Media and tagged embed video, embed vimeo, embed youtube, responsive, sortable videos, video plugin, video portfolio on September 11, 2015 by Vera Jaman. 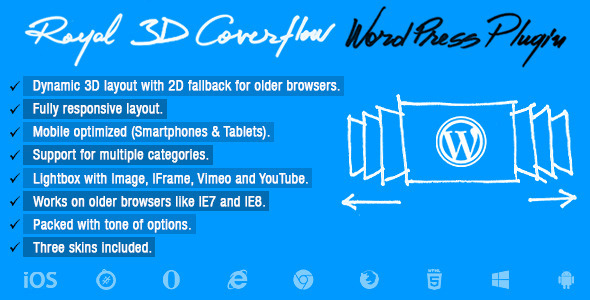 What is Royal 3D Coverflow WordPress Plugin? Royal 3D Coverflow WordPress Plugin is a fully responsive media 3D coverflow wordpress plugin that allows you to display media content with an unique original layout from a 3D perspective. It’s perfect for any kind of presentation, for anyone that wants to deliver a great impact on their visitors. It runs on all major browsers and mobile devices like iPhone, iPad, IOS, Android and Windows 8. 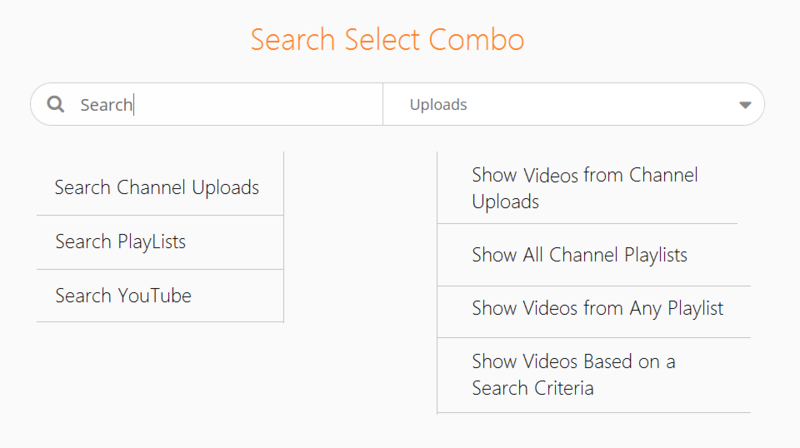 Also supports unlimited categories and each category can have any number of thumbnails. Responsive / Fluid layout with autoscale function. Mobile and desktop optimized (Ipad demo here!). Scroll and swipe functions for the desktop and mobile devices. Mouse Wheel support – navigation with mouse wheel scrolling. Keyboard support – the left and right arrows can be used for navigation through the thumbnails. Support for unlimited categories and each category can have any number of thumbnails. The option to start at a specific category. Customizable thumbnails size and topology geometry. Customizable description text for the center thumbnail. Customizable controls – each button and scrollbar component can be changed. Customizable reflection for the thumbnails. Custom action for the thumbnail click. Optional and customizable Shadow Box Gradient for the thumbnails. 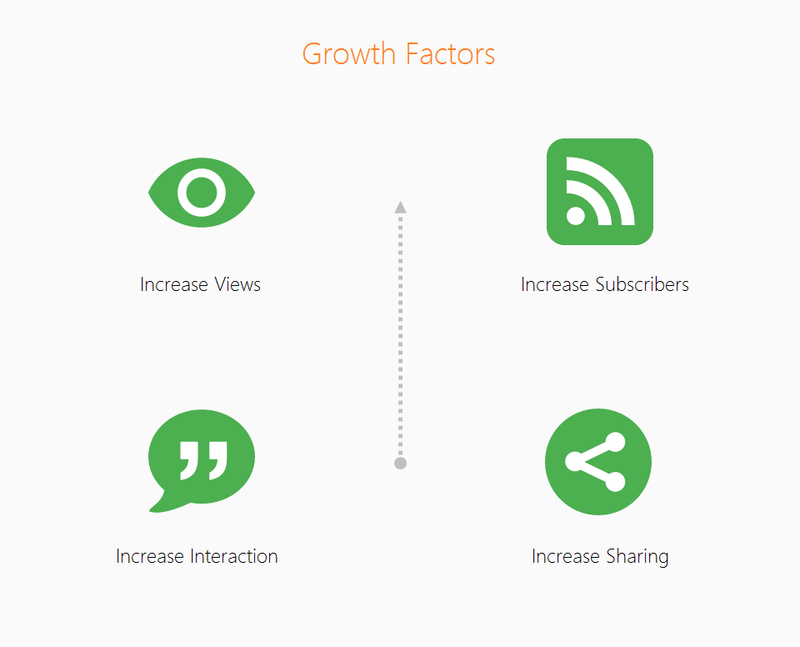 You can include multiple instances on the same page. Responsive / Fluid layout for the coverflow Lightbox. 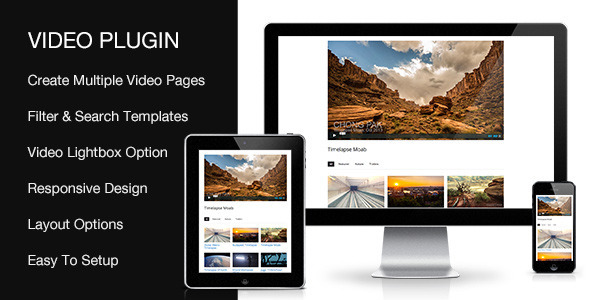 Vimeo and YouTube lightbox support. 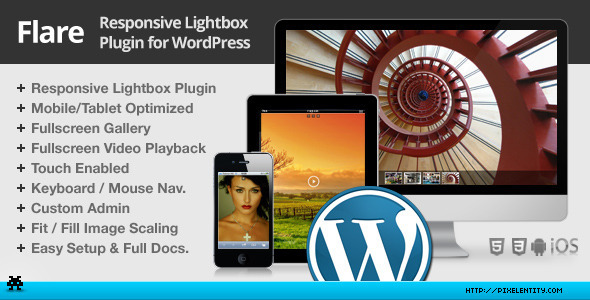 Zoom and panning support for lightbox images. Optional lightbox slideshow button, time and autoplay. Customizable border and background for the lightbox. Lightbox keyboard support – the left and right arrows can be used for navigation. Three skins included along with the preset configurations. Click here to see the admin panel video tutorial demo. The thumbnail’s image width and height will be equal to the thumbnail width and height values minus the thumbnail border size value. 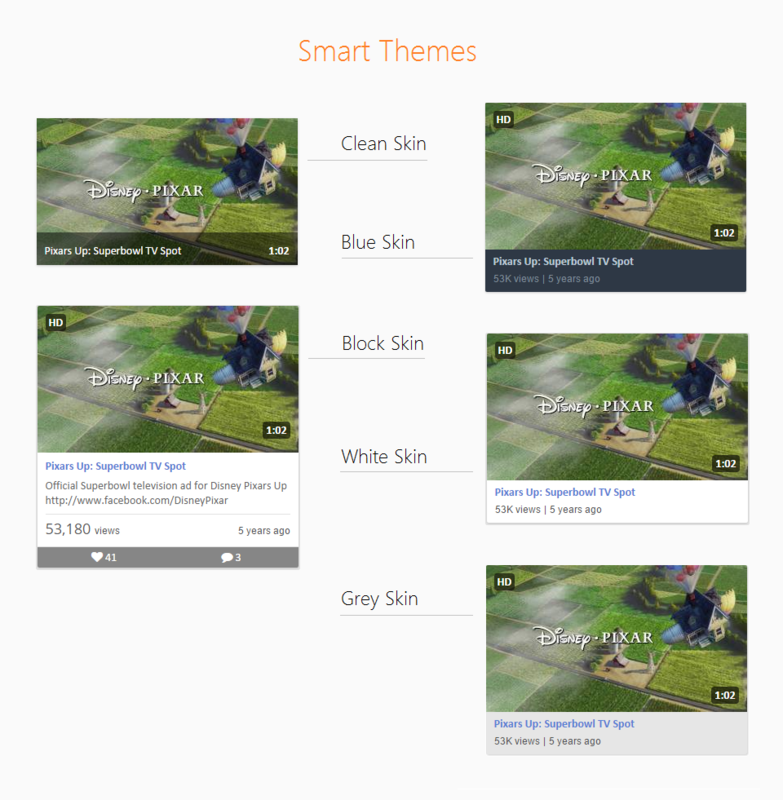 The coverflow also has a setting to limit the maximum number of thumbnails only on mobile devices, separately from the pc, for performance reasons. This is an optional feature it can be disabled but we advice to leave it active because it will increase the performance on mobile devices. This entry was posted in Media and tagged 3d, carousel, content, coverflow, html, image, jquery, mobile, plugin, responsive, simple, slideshow, swipe, touch, wordpress on September 10, 2015 by Vera Jaman. The pixelentity team is once again proud to bring you our new product: Flare – a responsive, touch enabled, mobile optimized lightbox WordPress plugin, which can be used to display single images/videos or entire galleries with caption support. Fullscreen/Boxed YouTube and Vimeo videos. This lightbox is designed to be used on responsive websites, as such on mobile devices the plugin requires that the meta viewport user zoom parameter be set to “user-scalable=0”. On desktops/laptop resolution this plugin supports non-responsive websites use also. This entry was posted in Media and tagged caption, fullscreen, gallery, html5, ipad, iphone, mobile, plugin, responsive, slider, thumbnail, video, vimeo, wordpress, youtube on September 1, 2015 by Vera Jaman. Responsive HTML5 audio player for wordpress. Using admin create unlimitednumber of playlists and players. Playlists can be mixed with any kind of music type (mp3, podcast, soundcloud etc…) Using shortcodes place multiple instances of audio player in post, page, sidebar or theme. Shortcode generator in post/page edit area (shortcodes for including player and player API available). Multiple players in page supported! Shortcode generator in post/page edit area (shortcodes for including player and player API available). Option to use only mp3 format available. FLASH fallback included for older browsers that dont support HTML5 audio. Uninterrupted audio playback across web pages (popup player is a separate window and browse your website while listening to music without interuptions! switch between player in normal window and in popup window while keeping player settings like current playlist, active item, volume etc.. Include multiple instances on the same page. Multiple instances automatically pause/stop playback when new sound is started. Optional song artwork (auto generated audio thumbnails). This entry was posted in Media and tagged audio, download, feed, html5, mp3, music player, plugin, podcast, soundcloud, streaming, youtube on August 17, 2015 by Vera Jaman. 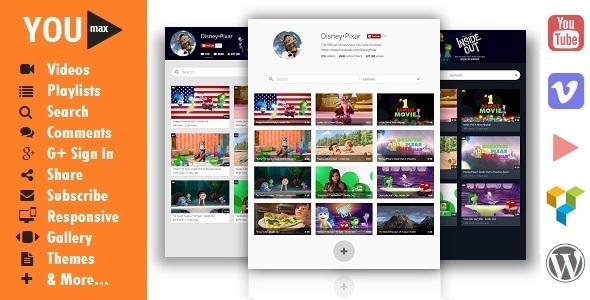 Youmax 8.0 is a WordPress plugin used to display Channels, Videos and Playlists from YouTube & Vimeo on your WordPress website. If you purchase the plugin before 30 Aug 2015, we will consider you as a Gold Member! Benefits: We have planned a 100% Customer directed release after August. We will accept all feature requests from Gold Members and the best 5 – 6 Features will be added in the Customer upgrade. 12. Bug fixes like time stamp bug etc. 1. Added new skin – Blue Contours! 4. 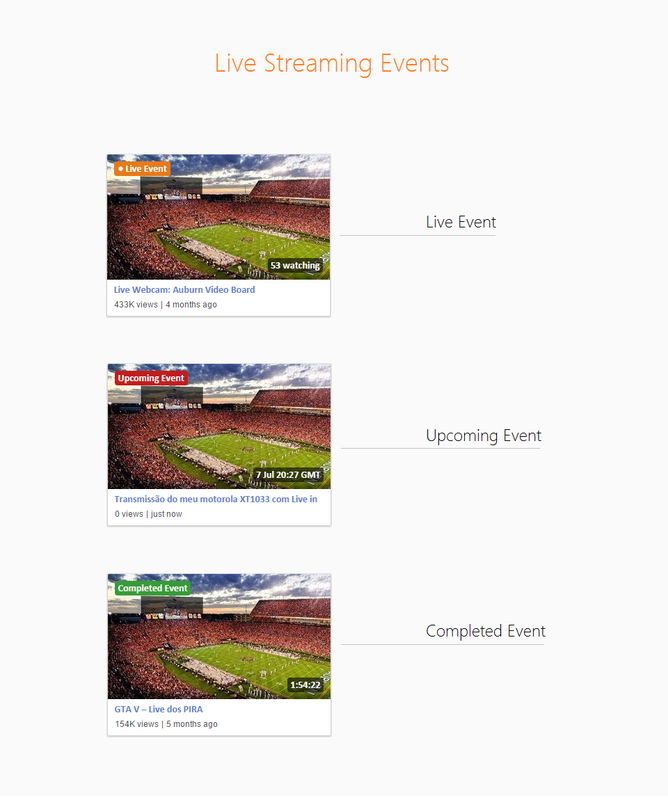 Other Options added like – display 1st video on load, auto-play videos etc. This entry was posted in Media and tagged channel, feeds, playlist, video gallery, vimeo, wordpress, youmax, youtube, youtube channel feeds, youtube channel gallery, youtube channel on websites, youtube playlist feeds, youtube playlist gallery, youtube playlist on websites, youtube video gallery on July 31, 2015 by Vera Jaman. 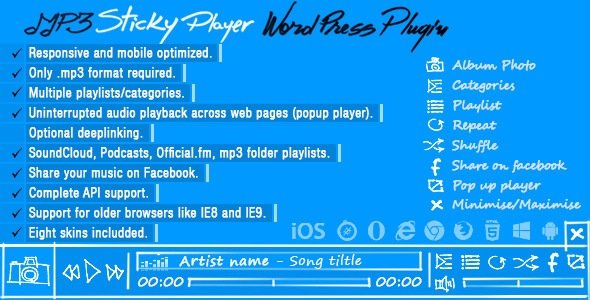 MP3 Sticky Player WordPress Plugin is a powerful responsive HTML5 mp3 player for your wordpress website that can be added at the top or bottom of the window, it runs on all major browsers and mobile devices like iPhone, iPad, IOS, Android,Windows8. MSP supports unlimited playlists and each playlist can have unlimited tracks. There are five playlist types, the first playlist type is the normal type that allows to add tracks (mp3’s files) with a high degree of customization, the other four playlist types can be created with a single data source URL that can be loaded fromSoundcloud, Official.fm, Podcast or generated from a folder with mp3 files. Packed with a huge amount of features like, external API, deeplinking, popup window and facebook share button, it is one of the most impressive HTML5 mp3 players available on sale. Mobile and desktop optimized (iPad/IOS demo or Android demo!). Uninterrupted audio playback across web pages (popup player in a separate window and browse the web while listening to music without interuptions!). FLASH fallback included for older browsers that don’t support HTML5 audio. Optional deeplinking (unique and sharable link for the current playlist and track). SHOUTCAST support. Play your favorite online radio directly in the player, of course shoutcast playlists can be created with ease! (only mp3 stream supported). Podcasts, Official.fm and SoundCloud support. Playlist from folder, create playlists from folders with .mp3 files plus ID3 metadatadetection. Support for unlimited playlists and each playlist can have unlimited tracks. Optional playlist and playlist window selector. 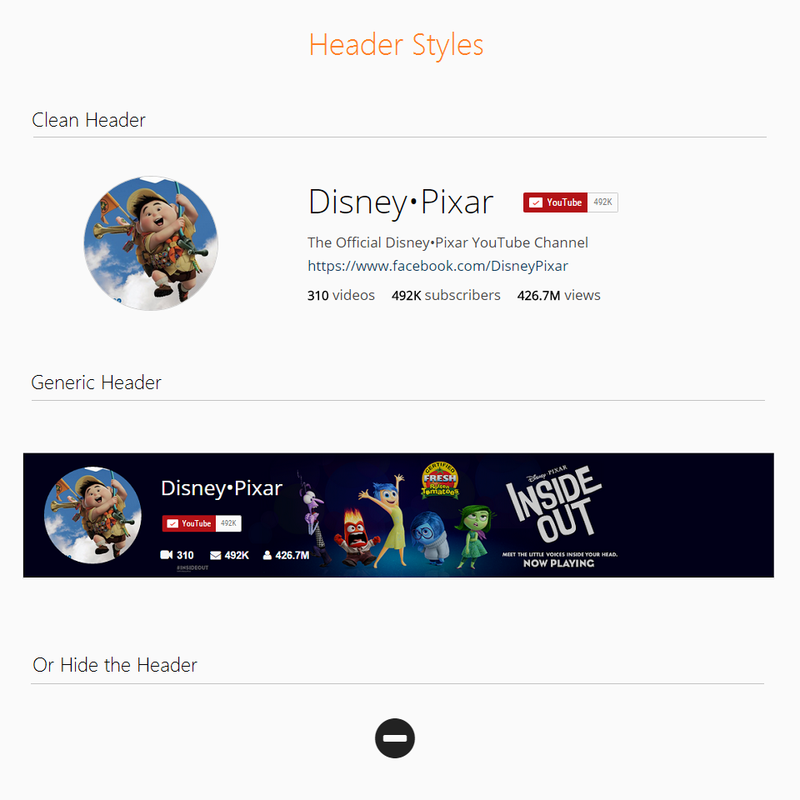 Three type of hover effects for the playlist window selector thumbnails. Optional playlist and playlist window selector auto open (the player can start with the playlist or playlist window selector visible or hidden). Optional playlist item download mp3 buttons (this buttons can be removed/added globally or individually for each track). Using the shortcode generator one or more MSP instances can be added in post, page, sidebar or theme. Customizable playlist window selector thumbnails. Playlist visible tracks limit (choose how many tracks to view in the playlist, the rest if any are scrollable). Playlist loaded tracks limit (maximum number of tracks to be loaded). The option to start at a specific playlist and track. Shuffle, loop or play next track once the current track has finished to play. Optional track thumbnail (this can be disabled globally or individually for each track). Optional download mp3 button located in the control bar (this button can be removed/added globally or individually for each track). Animated track title text if the text does not fit. This entry was posted in Media and tagged audio, categories, category, media, mp3, player, playlist, plugin, podcast, responsive, shoutcast, soundcloud, sticky, track, wordpress on July 28, 2015 by Vera Jaman. 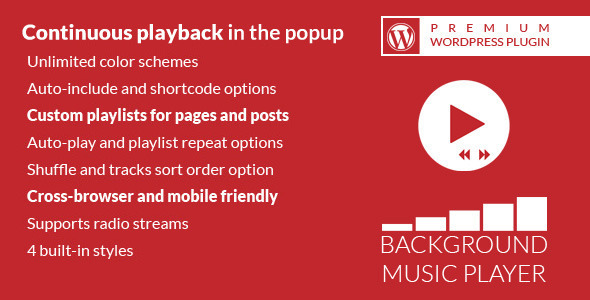 This WordPress plugin allows you to play tracks and radio streams right on your WordPress website. This plugin has lots of useful options and can be fully customized. Continuous Playback popup feature allows website visitor to open player in the popup. You can customize popup window size, window background color and image and player colors. 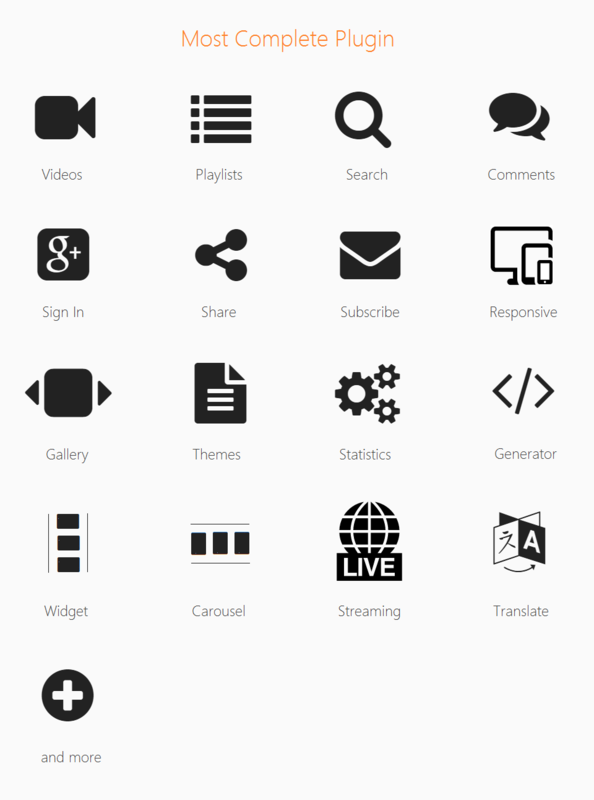 If you would like to use this plugin on your premium themes, please, purchase 1 extended license for each theme. This entry was posted in Media and tagged artist, audio, background music player, continuous, html5 audio, html5 player, mobile, mp3, music player, player, playlist, radio, radio stream, track, wordpress on July 3, 2015 by Vera Jaman. 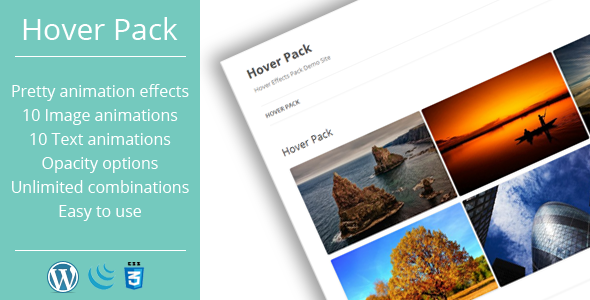 This hover effects pack plugin allows you to add image via shortcode, and set hover animation, text animation and text delay. This plugin adds new button to you WYSIWYG editor and options page, where you can select colors for color layer and text. This entry was posted in Media and tagged animation, css, css3, hover, image, opacity, pagebuilder, prettyphoto, shortcode, thickbox, touch, transparency, visual composer, wordpress on July 2, 2015 by Vera Jaman. 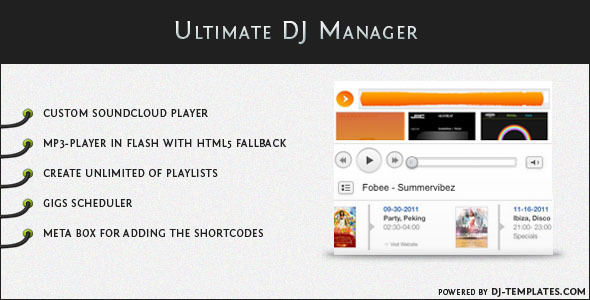 Ultimate DJ Manager is a “Must-Have” wordpress plugin for DJs and producers. The plugin comes with 3 outstanding Applications: Soundcloud Player, MP3-Player in Flash with HTML5 fallback and a Gigs Scheduler. NOTE: You can not save the chances you make. It´s only for demonstration. Supports your favorites tracks, users tracks, track sets and single tracks. SevenStyles for the outstanding flyers. Fobee for the awesome tracks. This entry was posted in Media and tagged artist, audio, dj, event, flash, flyer, gig, html5, mp3, music, player, producer, soundcloud, track on July 2, 2015 by Vera Jaman. Works great in all major browsers! The Über Audio WordPress plugin is designed to provide the ultimate listening experience from your post, page, sidebar or template. Über Audio allows you to put together a custom playlist quickly and easily. You can create beautiful players in seconds with the help of our Über Audio player generator. Within a few clicks you can have Über Audio players running on your site. You can store multiple playlists in the admin options of Über Audio and then select one playlist to display on each player. There’s no limit to the number of tracks you can add to your playlist. The design of Über Audio gives the user the ability to show or collapse the playlist for a simple viewing experience. Only have one track you want to play? Über Audio allows the admin to suppress the playlist view with one click. Über Audio has been tested and is compatible with all major browsers. We’ve also tested mobile devices like iOS and Android. For the best cross-browser compatibility it’s recommended to use .mp3 files. While Über Audio will play .ogg’s and .wav’s, for the best consistency across browsers use .mp3 files. Über Audio has two different color schemes to choose from, a dark version and a light version. You also have the ability to adjust the primary and secondary colors with easy to use color pickers. Über Audio supports 4 languages at this time. They are as follows: English, Spanish, Russian, and German. If you like the Über Audio plugin, would you consider sharing the love with your friends? Send them a direct link to this page, or share it on your favorite social network. Added dynamic URL validation option in playlist manager. 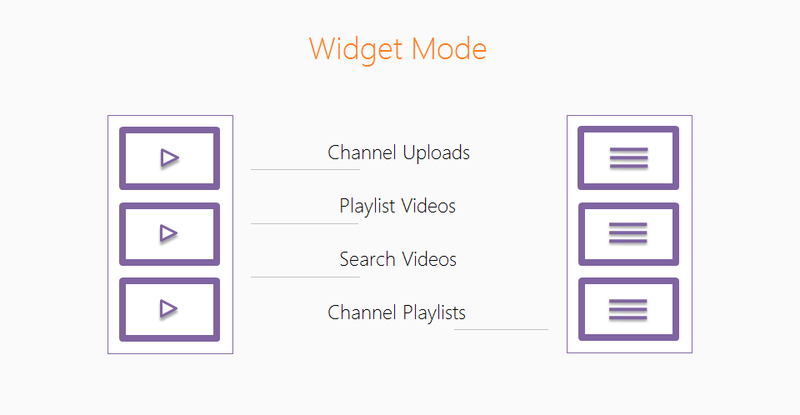 Added width controls for Post/Page Uber Audio Generator and widget. Shortcode support with easy to use shortcode generator with a live preview of player. Added the ability to hide playlist by default when a player loads. Multi-byte character sets are no longer a problem. Single file playlists will now not show the playlist at all in the player. Fixed several miscellaneous bugs in Internet Explorer. Fixed a bug that caused an audio file to not be accepted in the playlist manager in certain conditions. Fixed a bug that cause NaN:NaN to show up in the player under certain conditions. This entry was posted in Media and tagged artist, audio, dj, flash, html5, media player, mp3, music, music player, ogg, player, sound, track, uber, wordpress on June 18, 2015 by Vera Jaman.